I've always thought this book was a little weird. The "Mr. Rabbit" has always seemed a little too grownup and mysterious to be helping a little girl devise a gift for her mother's birthday. Maybe '62 was a less sinister time, but the way Sendak illustrates the rabbit is a bit jaunty. None-the-less, I like this book for its absurd repetitions and fruit/color collecting. "She likes Red," said the little girl. "Red," said Mr. Rabbit. "You can't give her red." "Something red, maybe," said the little girl. 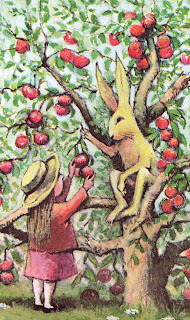 "Oh, something red," said Mr. Rabbit. "What is red?" said the little girl. "Well," said Mr. Rabbit, "there's red underwear." "Little girl" as a two word combination is written approximately 40 times, and (not including the cover and title pages) "Mr. Rabbit" is written 38 times. There have always been some mysteries for me attached to this book (whenever I've gotten close to a title, I always have unanswered questions about things), but in this case, Ms. Zolotow and family have detailed on her Web site the why and how of how this book came to be. On the site, Mr. Rabbit is described as.... "The rabbit, slightly louache in appearance but always respectful..." Though I am not sure what louache actually means, it sounds apropos. Footnote: I think it is a form of this word -- louche \LOOSH\, adjective: Of questionable taste or morality; disreputable or indecent; dubious; shady...... Makes sense. Of all the books of my childhood this is the one that takes me back to a distinct time and place memory. Pulling the book off the shelf in my gradeschool library and hiding in the stacks to read it. Not hiding because the book was subversive but just hiding so I didn't have to go back into the classroom. 40 years ago but I remember it like it was yesterday.